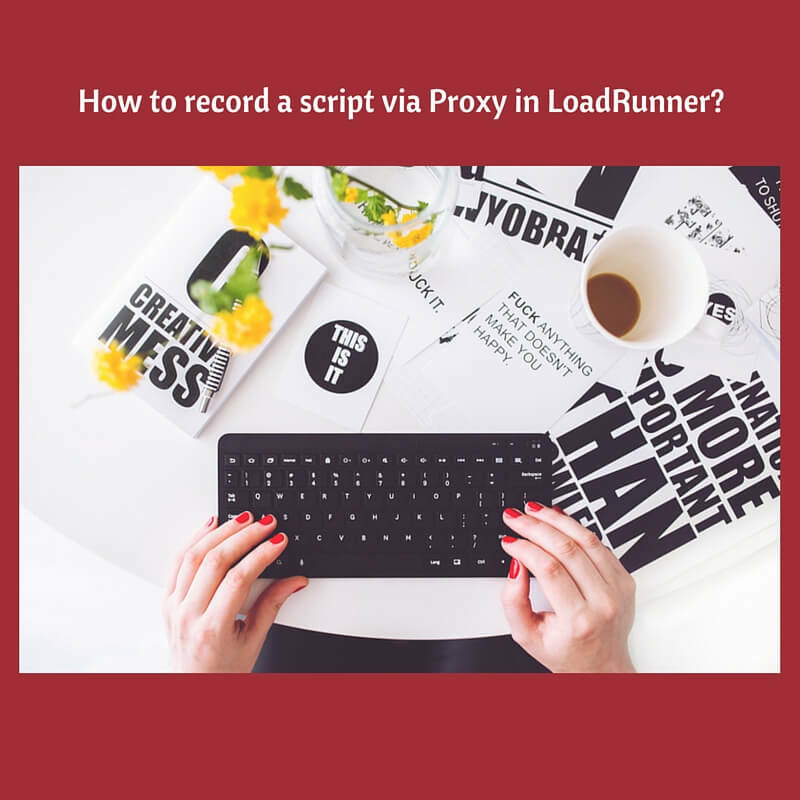 How to record a script via Proxy in LoadRunner? You cannot install VuGen on your client machine due to various restrictions such as lack of admin privileges, lack of required software etc. For each case you need to follow certain methods to record in VuGen. But below is the generic understanding of how to record a script via Proxy in LoadRunner. Suppose if you are not able to install VuGen on machines which has Linux or Mac OS machines or mobile devices. VuGen allows you to record the application flow via proxy. VuGen acts as a proxy server and captures all the traffic between client and server. Recording via proxy in LoadRunner is not available for all the protocols. Here are the few protocols which supports proxy recording: Web HTTP/HTML, Flex, and Java over HTTP, Oracle NCA, and Oracle – Web. You must be able to provide port and address of VuGen machine on the client device which has different OS. Both the client and proxy machine (VuGen) must be on same network. It is advisable to delete any history/cache on the client’s machine. If there is a multiple target machines (application under test), VuGen proxy can correctly forward the data as per Host HTTP header. 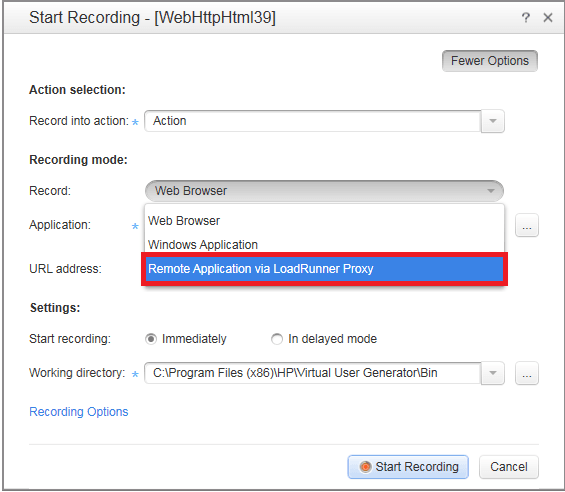 To record remote application via LoadRunner proxy, in Start Recording dialog box, you need to select Remote Application via LoadRunner proxy as shown below. 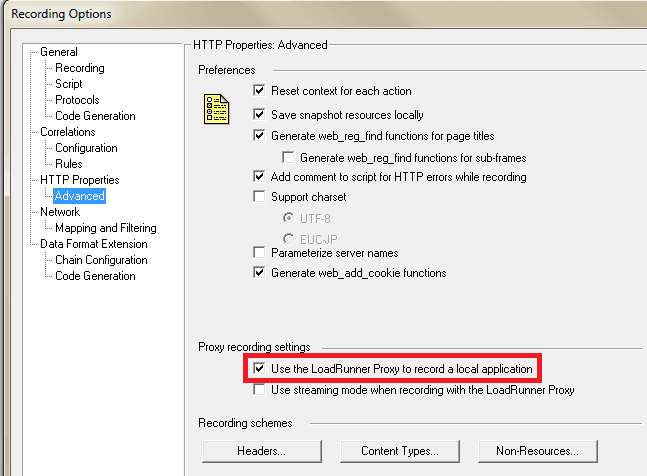 To record local application using LoadRunner proxy, make sure that the below check box is checked in Recording Options > HTTP Properties > Advanced as shown below. If the application communicates using SSL (Secured Socket Layer), you need to import the certificate to the client machine. Download the certificate and import it. Internet Explorer, select Internet Options > Content > Trusted Root Certificate Authorities > Import. Firefox, select Tools > Options > Advanced > Certificates tab > View Certificates > Authorities > Import. It is preferable to always delete the cache and history before recording the business flow. In this article, you have learn how to record a script via Proxy in LoadRunner? In next article, we will see about script structure in LoadRunner.